Play: "We fight in the shadows." Death: "Sleep with one eye open." Shaw draws Vilespine Slayer. Vilespine Slayer, in addition to its original text, also has: 'Rush. 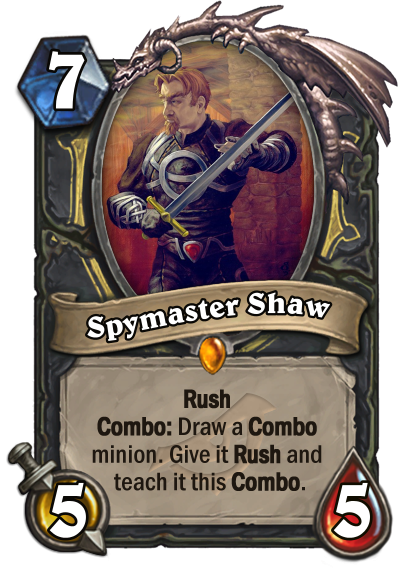 Combo: Draw a Combo minion. Give it Rush and teach it this Combo.' Vilespine Slayer draws Edwin VanCleef. Edwin now has Rush and the aforementioned Combo. And so on. What results is an infinite value engine that hinges on running a significant number of Combo minions, possibly including minions that currently see no play, like Defias Ringleader and Kidnapper. 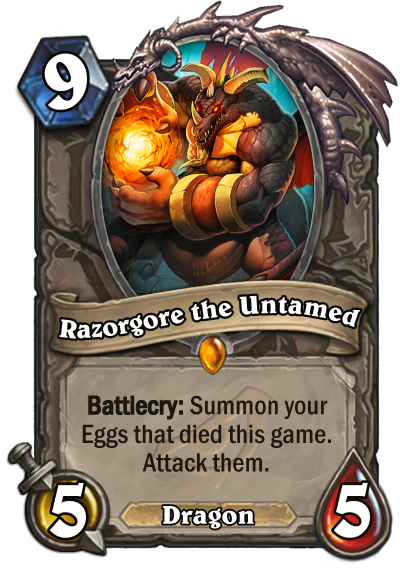 Wanted to make a card that interacts with Eggs, since it's a minion pseudo-type that doesn't have any existing interactions. A natural choice was of course Razorgore, given the theme of his Warcraft encounter. Originally read 'Destroy them,' but I didn't want to leave Dragon Egg out of the interaction and 'Attack them' felt more flavorful. 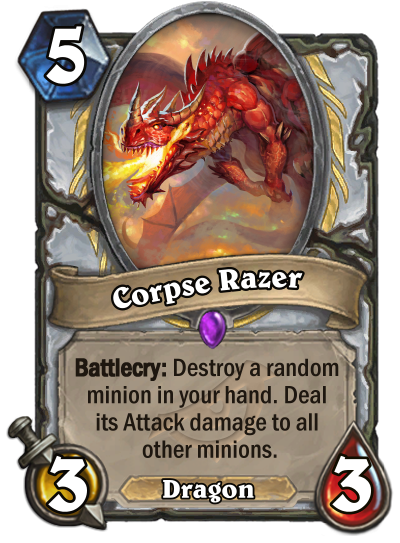 Both cards 'counterfeit' Corpse Raiser's statline and name. Decided to do something less mechanic-oriented to promote some more creative deckbuilding. A word game, as the name implies. -The Tavern Brawl is Wild friendly. -Mulligan happens normally: alphabetical drawing starts after mulligan is complete. -If you have duplicates, say 2x Acherus Veteran and 2 Arcane Intellect, you draw the 2 Acherus Veterans first. DanAnon posted a message on Question - top cards of all time? Warsong Commander. It used to give any minion Charge. DanAnon posted a message on (New Zubatlock Added ! ) Zubatlock and Handbuffy Discolock !! Ehr... "bat" and "lock" I get, no problems, but "Zu"? Afraid I might be missing some obvious reference there. DanAnon posted a message on Cards you haven't seen in AGES. Had the opportunity to face Reynad in Legend once. He ran Unite the Murlocs, Ice Fishing, and Ice Breaker. DanAnon posted a message on Have you tried Mass Hysteria yet? Haven't attended a tavern event but watched Kripp's footage of the card. Minions do not die while Mass Hysteria is resolving. All minions get to attack first, then any minions that reach 0 Health or were damaged by Poisonous die after Mass Hysteria's effect resolves. If you have two Shirvallahs and a Spirit of the Dead and all of them die during Mass Hysteria, you don't get any copies of Shirvallah. To answer your questions: Malganis's aura stays until the effect fully resolves. Deathrattles do not trigger until after the effect resolves. 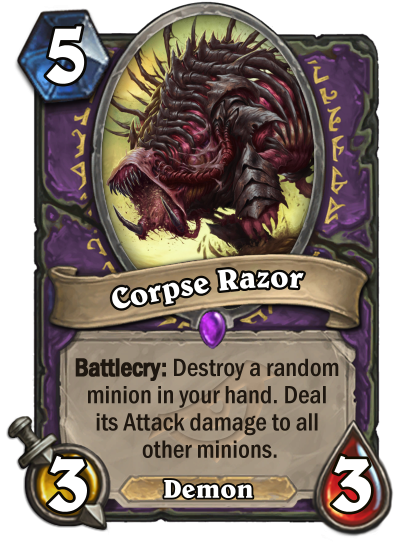 As a general rule, minions do not die during an effect. As I like to think of it, spells that destroy minions or deal fatal damage simply "mark" minions for death. Death only occurs once the effect resolves, along with any effects that trigger due to said minions dying (Deathrattles, Cult Master, Spirit of the Dead, etc.). Lots of Aggro decks ran prenerf Owl just to break Taunts. This card is insane. For those wondering, Treant Druid is a bottom-of-the-barrel archetype. It's not even Tier 4 on Metabomb. Treespeaker is not likely to singlehandedly carry Treant Druid. Just be aware that it will be tougher than initially seems to use this in an Aggro list, since the Ancients can't attack the turn they're summoned, which sets this apart from flood damage cards like Savage Roar, Level Up!, and Bloodlust. If burst damage is the goal, Savage Roar will be the more efficient (and less situational) alternative. This interpretation is consistent with known interactions. Warsong Commander does not buff minions after Charge was cast on them, for instance. Not sure why this guy's being downvoted. He's saying he feels it would be better design, not better in power level. There's a difference between making a counterargument and misrepresenting someone's comment for the sake of convenient ridicule.